I heard that statement from a zoo keeper one day. He was explaining how flamingo got their pink color. 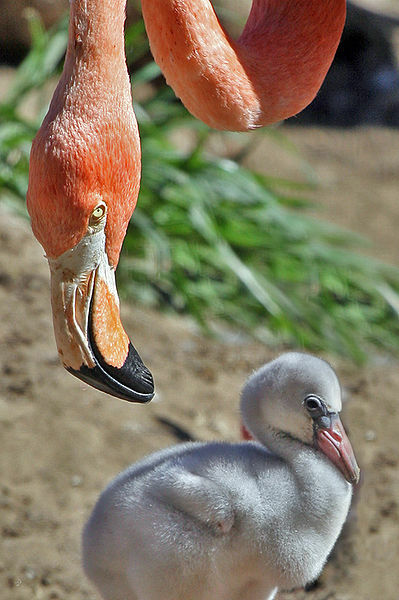 Young flamingos hatch with grey reddish plumage, but adults range from light pink to bright red due to aqueous bacteria and beta carotene obtained from their food supply. A well-fed, healthy flamingo is more vibrantly colored and thus a more desirable mate; a white or pale flamingo, however, is usually unhealthy or malnourished. Thus prove that we're what we we eat or in other words to be fit and healthy we need to eat good food. I didn't expect to get a lecture on nutrition that day but the zoo keeper's words got stuck in my head. Chris and I have been gradually changing our diet but the process have been slooooow mostly because my frugal self is having a hard time justifying paying more, sometimes double, for organic foods. Then I read this book: "Smart Mama Smart Money" in which the author wrote: "We should be paying close attention to what we eat because we are giving this to our family. We should care whether it's genetically modified crops and pesticides, unwanted antibiotics and hormones, or the way the animals are raised and feed because the stuff they feed these animals is not good for our little ones. What's the point of saving money on products that could possible compromise their health?" Lately, I have enjoyed learning about nutrition and natural living from my dear friend, Vicky who shares about what she learned on her blog: Pasture Living. Two other blogs where I enjoy learning about natural living are: Passionate Homemaking and Keeper of the Home. a. Get our pesticide-free veggies and fruits from a local farmer market. If you live in our area, we found that Cupertino Farmer Market has the best pricing. In all farmer market, the vendors usually cut their prices 30 minutes before they close. However, the downside of coming late is they may already run out of some veggies or fruits. b. Shop organic and in bulk. I still can't bring myself to shop at Wholefoods yet but thankfully Costco recently carries lot of organic products: milk, meat, eggs, flour, coconut oil, and so on. Yay! c. Utilize my freezer and crock-pot more, which result in less eating out. Nevertheless, I am well aware that natural living can become an idol so I am closing this post with wise words from The Frugal Girl, "I know from personal experience that it’s easy to fall into a frugaler-than-thou or greener-than-thou kind of mindset, but I also know that blessed little in the way of good stuff comes from that way of thinking. So, when you’re tempted to look down on someone else because they’ve made a difference choice from you, try what helps me: reminding yourself that difference isn’t necessarily worse or wrong. It could just be…different."